According to a new study, up to 66% of customers would recommend a shopping centre based on the cleanliness of its sanitary facilities. Women are more likely to remember clean sanitary facilities than men. Jumbo will be the first in Finland to adopt smart technology that can be used to enhance cleaning efficiency and measure customer satisfaction in the toilet facilities. A survey conducted at Shopping Centre Jumbo in summer 2015 showed that clean sanitary facilities influence the choice of shopping centre; this was reported by almost one-third (30%) of the respondents. The study also showed that up to 66% of customers would recommend a shopping venue based on the cleanliness of its sanitary facilities. The study was carried out as an interview survey of the customers who used the toilet facilities at Shopping Centre Jumbo. The cleanliness and comfort of the toilet facilities were improved gradually during the four-stage study. The study, which was conducted by Ediste Oy, had a total of 455 respondents. “We wanted to find out whether the cleanliness of the toilet facilities improves general customer satisfaction and increases the number of recommendations. The study showed that cleanliness matters; throughout the study, the willingness of customers to recommend the shopping centre based on the cleanliness of its sanitary facilities increased by 21%,” says Jasu Jaranka, who managed the project at Lindström. The results of the survey show that almost one-half of the respondents (42%) said that the general cleanliness of the shopping centre improved after the sanitary facilities were updated. “It was extremely interesting to find out what an incredibly strong image clean and neat toilet facilities create of the entire shopping centre, and how they influence how comfortable customers generally feel at our shopping centre,” says Olli Lehtoaro, Shopping Centre Director at Shopping Centre Jumbo. The study showed that women are more critical about the condition of the toilet facilities than men and more likely to remember clean toilet facilities. Almost one-half (46%) of the women said that they found room for improvement in the cleanliness of the toilet facilities, and one in four (25%) said that they remembered clean toilet facilities. Respectively, only 19% of the men found room for improvement in the cleanliness of the toilet facilities and 17% said that they remembered clean toilet facilities. “Women often need to put their handbag down next to the sink while they wash their hands, for example. If the surface is dirty or wet, the lack of cleanliness in the facilities will often stick in their mind,” says Jaranka. Over one-half (59%) of the respondents mentioned the hand towel as their preferred option to dry their hands after washing them, 38% preferred paper towels and 17% favoured the air dryer. “It is easy to dry your hands on the textile hand towel; studies* show that it is a hygienic option and it does not generate any rubbish. These are probably some of the reasons why it is so popular,” says Jaranka. Jumbo will be the first in Finland to adopt new smart technology that makes it possible to measure and maintain customer satisfaction and the cleanliness of sanitary facilities more effectively. 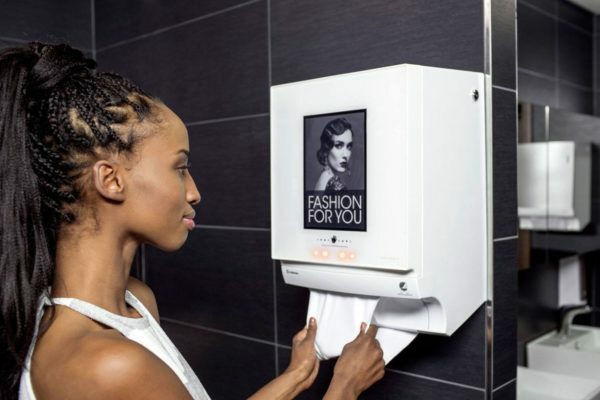 Lindström will supply the technology displays that will be mounted on the company’s hand towel dispensers. The technology will be implemented in all the sanitary facilities at Jumbo during November. “In future, the cleanliness of the sanitary facilities will be even more important to us because it improves the comfort of customers. The technology will enable us to collect direct feedback about for example the willingness of the shopping centre’s customers to recommend us and will help rationalise our cleaning operations. In future, the cleaner will no longer need to go and check the toilet facilities at the other end of the shopping centre but instead will automatically receive a text message on his/her mobile phone when the facilities need cleaning. This saves the cleaner’s time and also makes sense economically,” says Olli.